A hand-laid and hand-finished replica of our own original model. Coconut shells are cut into hundreds of small pieces, which are then ground, shaped, polished, and placed to form the overall design. Our reproduction in modern synthetics allows this beautiful natural material to be used indoors or out. We finish our replicas by hand to emulate the variations of Mother Nature's colors. Because of the artisit's touch, like real coconut, no two tops will ever look exactly alike. These subtle differences are your assurance that your purchase is a handcrafted work of art. 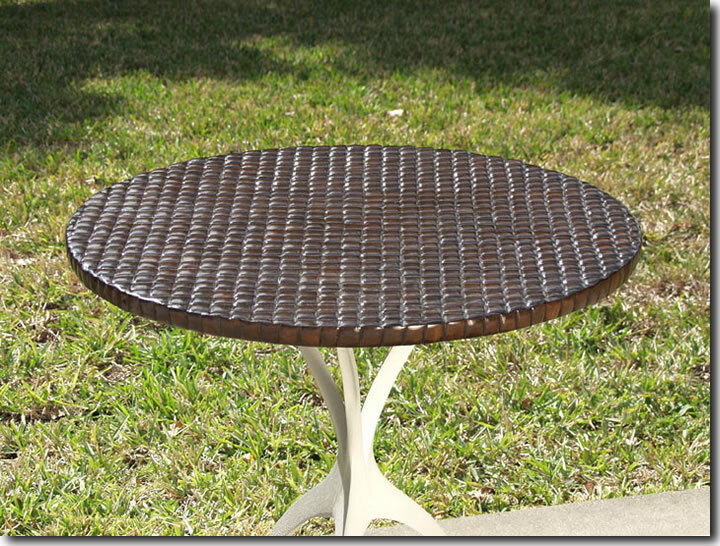 The CoCo Table Top comes in 24" round, 30" round, 48" round, and 25"x38" oval sizes. Photos of all top sizes are available upon request. All Atelier CoCo tops are 1" thick, with a fully enclosed smooth bottom. CoCo may be fastened to any type of table base with standard stainless wood screws.